With 14 kilometres of white sandy beach and a view of Dunk Island at the front, and the tropical rainforest and Cassowary conservation area at the rear, Big4 Beachcomber Coconut Holiday Park is perfectly positioned for your holiday. You will find them one and a half hours south of Cairns and approximately two hours north of Townsville. The cabins and sites are nestled into award winning gardens, many areas with beach views and with various choices for all budgets. The licensed cafe is open every day. The park also features an award winning resort pool with slide, mushroom waterfall and Balinese huts. Modern colourful playground area, half tennis/basketball court, television room with Foxtel sport, games room and camper's kitchen. Free wi-fi and a stinger net in the ocean are also available. Their knowledgeable and friendly staff can provide practical local advice of things to do and see and their office provides a complimentary tour booking service. 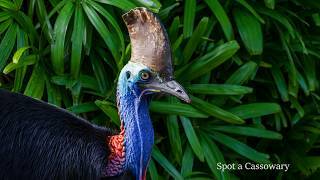 In addition, the endangered Southern Cassowary is a regular visitor to the park, allowing you a close look at this private and beautiful creature. Spacious two bedroom villa with queen bed and bunk bed (single bed over double bed), ensuite bathroom/toilet with large spa bath, fully equipped kitchen with open plan lounge/dining with sofa bed for additional people. television/DVD, air conditioning, undercover parking. Large deck area with outdoor setting to sit and enjoy the view of the award winning gardens. Sleeps five (plus two on a sofa bed). Spacious two bedroom villa with queen bed and two sets of single bunks (two single bed over single bed), ensuite bathroom and separate toilet, fully equipped kitchen with open plan lounge/dining. television/DVD, air conditioning, and a large deck with outdoor setting. Sleeps six. Open plan cabin with double bed and bunk bed (single bed over single bed) and futon, ensuite bathroom/toilet, kitchenette and microwave, television, air conditioning and a deck with outdoor setting. Located close to the pool and set in the award winning gardens. Sleeps four (plus two on the futon). Beachfront open plan cabin with stunning views of Dunk Island. Double bed and small bunk bed (single bed over single bed), kitchenette with microwave, television, air conditioning and a patio area with outdoor setting. Park bathrooms and laundry are conveniently located and there is a a modern spacious camp kitchen with generous cooking facilities and refrigeration, outdoor gas barbecue. Some cabins include a fold out divan. Sleeps four or six. One row back from the beach front and exactly the same as our Beachfront Shack, an air conditioned, open plan cabin set in their landscaped gardens. Moments from the sandy beach which has stunning views of Dunk Island. Double bed and small bunk bed (single bed over single bed), kitchenette with microwave, television, air conditioning and a patio area with outdoor setting. Park bathrooms are conveniently located and included a modern spacious camp kitchen with generous cooking facilities and refrigeration, outdoor gas barbecue, bathrooms and laundry. Sleeps four. Beautifully landscaped sites with either concrete slab or grass, power, sullage and water. Park amenities are conveniently located and included a modern spacious camp kitchen with generous cooking facilities and refrigeration, outdoor gas barbecue, bathrooms and laundry. Their sites are various sizes. Upon booking, they allow for a 20 foot van, plus draw bar, plus vehicle. If your accommodation is larger, please ensure that you advise them so that they can accommodate you on an appropriately sized site. Beautifully landscaped unpowered grass sites offer. Park amenities are conveniently located and included a modern spacious camp kitchen with generous cooking facilities and refrigeration, outdoor gas barbecue, bathrooms and laundry.